This week is Mental Health Awareness week. Mental health awareness has been running since 2000.It aims to help awareness of mental health and wellbeing. This year Mental Health Awareness Week is focusing on mindfulness. I enjoy practicing mindfulness when walking and will share more with you. I liked the sound of being in the moment when walking and not letting my thoughts take over and just paying attention to the present moment. I therefore have started practicing mindfulness when walking. I enjoy walking and have found mindfulness walking useful and relaxing, especially when my brain is overloaded. I only take my camera with me and ensure I escape both the telephone and Internet by not looking at my phone. I now find walking is the one thing I ensure that I do at least twice a week on my own for at least 30 minutes. At least 10 minutes of my walk focuses on my footsteps. I don’t let anything come into my mind. I focus on my breathing and what I can feel and see. Through this not only have I learnt to free my mind for 10 minutes but I’ve started appreciating nature – sound, feel and what I can see. In the last year, I have now extended my walking to taking my clients walking with me. The counselling clients, who use my walk and talk therapy, tell me that walking side by side with me has become meaningful to them. In that hour they escape from their world and it allows them to feel normal. Often we stop from walking and allow ourselves to concentrate on the moment. I’ve recently had a client who has been bereaved who says a combination of walking, talking and mindfulness has helped her work through her grief. Mindfulness when walking works for me and for many of my clients. However, I have to admit, that I often find it difficult to practice mindfulness at other times. I therefore feel it is important to remember that mindfulness does not work for everybody. A client needs to find out for themselves whether it works for them or not. They must not be pushed into practicing mindfulness. They need to made aware that they have to try various techniques before they find the one that works for them. I thought it would be useful to explain what mindfulness is and how it works. Mindfulness can help improve both your mental and physical health. It is a form of meditation (involving concentration) and acceptance. It is about focusing on the present moment and accepting it without judgement. People who practice mindfulness say that they find they stop worrying about the future or the past and become less pre-occupied with their self-esteem. It helps them accept their situation or experience rather than react to them with disinclination or avoidance. Mindfulness can also help towards relieving stress, improve sleep and improve a person’s overall wellbeing. So how do you practice mindfulness at home? The main goal of mindfulness is to be able to relax and focus on the present moment. It is a form of mediation. At home the best way to practice mindfulness is to sit in a chair. You need to pay attention to your breathing. If your mind wanders, pay attention to it and refocus on the present moment. Keep following your breath. Do not judge yourself. Just pay attention to your thoughts and all of your body sensations. Overall mindfulness involves being kind and forgiving towards yourself. If that doesn’t work and you love being outdoors try mindfulness when walking. Focus on your steps and breathing. 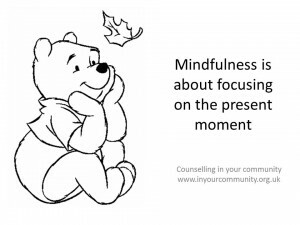 If you are interested in mindfulness, have a look at www.mindfulness.org for further information. My next blog post will look at mindfulness and the family. What is your experience of mindfulness? If you would like to find out more about mindfulness and walking with me, then feel free to contact me for further information. This entry was posted in walking therapy and tagged Mental health awareness week, mindfulness, therapy, walking on May 12, 2015 by Hazel Hill.